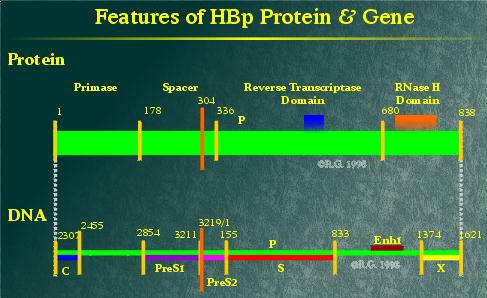 HBp has been divided into four characterized domains. Based on sequence homologies and studies on the mechanism of viral genome replication, most parts of HBp are indispensable. The N-terminus portion of the protein acts in priming (-)DNA strand synthesis and ends up covalently linked to the 5' end of the (-) DNA strand. This domain is termed primase. The subsequent domain does not appear to have any enzymatic function, but acts as a spacer between the first and third domains. The fourth domain of HBp possesses its RNase H activity. (7), (8) This domain also plays a key role in HBV genome replication. 1. Toh, H., Hayashida, H. and Miyata, T. 1983. Sequency Homology Between Retroviral Reverse Transcriptase and Putative Polymerases of Hepatitis B Virus and Cauliflower Mosaic Virus. Nature; 305: 827-829. 2. Mack, D.H., Bloch, W., Nath, N. and Sninsky, J.J. 1988. Hepatitis B Virus Particles Contain a Polypeptide Encoded by the Largest Open Reading Frame: A Putative Reverse Transcriptase. J. Virol. ; 62: 4786-4790. 3. Lanford, R.E., Kim, Y-H, Lee, H., Notvall, L and Beames, B. 1999. Mapping of the Hepatitis B Virus Reverse Transcriptase TP and RT Domains by Transcomplementation for Nucelotide Priming and by Protein-Protein Interaction. J. Virol. ; 73: 1885-1893. 4. Urban, M., McMillan, D.J., Canning, G., Newell, A., Brown, E., Mills, J.S. and Jupp, R. 1998. In vitro Activity of Hepatitis B Virus Polymerase: Requirement for Distinct Metal Ions and the Viral Epsilon Stem-Loop. J. Gen. Virol. ; 79: 1121-1131. 5. Bartenschlager, R. and Schaller, H. 1992. Hepadnaviral Assembly is Initiated by Polymerase Binding to the Encapsidation Signal in the Viral RNA Genome. EMBO; 7:4185-4192. 6. Tavis, J.E., Massey, B., and Gong, Y. 1998. The Duck Hepatitis B Virus Polymerase is Activated by its RNA Packaging Signal, Epsilon. J. Virol. ; 72: 5789-5796. 7. Chang, L-J et al., 1990. Mechanism of translation of the hepadnaviral polymerase (P) gene. Proc. Natl. Acad. Sci. USA; 87: 5158-5162. 8. Radziwill, G. et al., 1990. Mutational analysis of the hepatitis B virus P gene product: domain structure and Rnase H activity. J. Virol; 64: 613-620.